My little one insisted on being with me on stage. It was cool though. I didn't mind at all. It was better to have him up there hanging out with me, being still, than to have him running around driving the watcher crazy. This gig was outdoors at Keney Park in Hartford, CT. I always wanted the fam to come and chill at the outdoor gigs. It was really nice when they wanted to. It's amazing when you look back and see things and think about those things. My little baby is much older now - grown man in fact. The concept of time and the past really take a different perspective when you view them from the present day. -- if that makes sense. I wish I could go back and stay in this time right here. 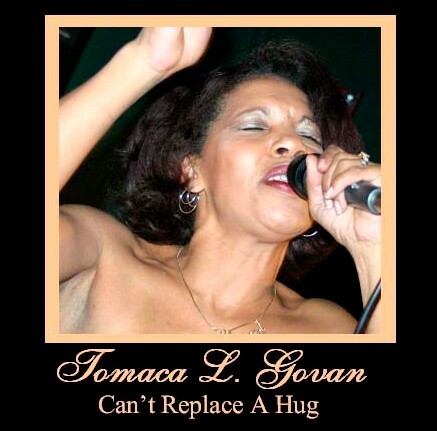 Click here to skip Tomaca's blah, blah, blah and go straight to the lyrics for this song. Sometimes it can take me days and days to write a song. This one I did in about an hour. It was the first one that I wrote when I started writing again after years of not writing. I was really tired of performing nothing but cover tunes in bands. In fact, I quit the band I was with because I was so tired of doing cover tunes. I was really beginning to hate performing certain songs. There were a couple I refused to do anymore. What I would do was pull women up on stage and let them do it. They were thrilled to do stuff like "I Will Survive" and help sing "Respect" with a group of other women. That was actually fun. They had fun, I had fun and the guys in the band got a laugh out of it. And, of course, if the women were attractive, the guys in the band were happy. The crowd goes wild when they see their friends on stage. It's like all of a sudden they see them in a different light. It's an interesting phenom. And the "performers" get to experience something very exciting in that moment. Something they never thought they'd ever do - get up on stage and sing. Was cool. So yeah, back to this point. I wanted to do my own stuff. I remember vividly standing in the bedroom when I was thinking about how much I really missed my dad. He died in the 80's. It is the 2000's at this point as I stood with this memory. Thought about how much my mom must miss him. Dad was in the Air Force. I imagined him being away during WWII... mom home with children. How much he missed her and being home at that time. Those feelings of love they had between them. They could write to each other every, single day but, nothing could ever take the place of the comfort and the joy of actually being together. A hug. An extended hug. Holding each other so deeply that in that moment they become one person. Letters can't replace a hug. Then my mind went further thinking about soldiers in this present time- away and just wanting to be back home with the one they love. Can't replace a hug. The words came. I sat down on the bed with a pad and let them come. There was a little tweaking required, but not much. It was perfect. She's singing to him as she's trying to imagine what he's feeling and missing him in every syllable and every breath. And trying to ease his mind about what she's going through and about what he's going through. Then letting him know that he's so important to her that she's going to be there waiting for however long it takes. As soon as I started in the studio, this was the first song we worked on. Michael did a wonderful job with the production. "Can't Replace A Hug" is dedicated to anyone who misses anyone else. And especially to all soldiers everywhere who can't be home because there is war. I hope humanity will choose to advance to the point when there is no more war anywhere, ever.